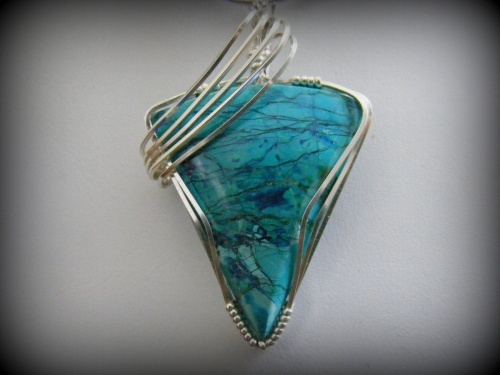 This dreamy Chrysocholla gemstone has marbled navy, greens and, turquoise runnig through it making it a unique, one of a kind delights. Stone is too pretty to embellish with too much silver so, I made a swoop of silver coming across the top of the stone which is just enough to make this piece "pop". Measures 1 3/4" from top of bail to bottom of stone and 1" wide. Comes with a sterling silver snake chain.